Have you ever wondered what was on those old home movie reels or video tapes tucked away in some dresser drawer or closet all these years, and considered doing something about it? Allow us to help you take the next step and resolve the mystery - by breathing new life into those old films and tapes, and in the process transporting you back to another time - where you can become reacquainted with then younger self, family members and friends - living and since departed. Now you can share and relive these pleasant memories with your loved ones, while at the same time helping to chronicle and preserve your family history for your own children and future generations. As a standard procedure, we carefully inspect and preview all home movie film and video tapes in order to make any necessary repairs, (edit out bad scenes and/or replace defective splices with 8 or 16mm films), & clean and lubricate - before the actual digital transfer occurs. We then directly import the live action image to our studio’s 3-chip DV camera directly if tape, or via a high-res optic conversion system if film, resulting in visuals that are as clear and crisp as your original footage. We thoroughly clean all 35mm slides, film negatives, and photos before scanning at 4800x9600 dpi, from which they can be either edited for a slideshow presentation, or saved as seperate digital files on disk or thumb drives. 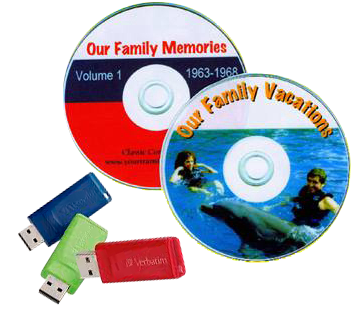 A customized title page on your DVD would contain a main title in your own words and can include the family name (i.e., "Benton Family Memories", etc. ), a musical theme, color graphics, plus up to 6 subtitled menu buttons for easy DVD navigation. Customized introductory titles of your choice can be easily included anywhere in your DVD presentation, and can be either transcribed from your personal notes, or from the reels, canisters, and boxes themselves.You're allowed your choice of any musical category to accompany your silent movies, slides, or photo presentations - ranging from Classical, Popular Contemporary, the Big Band sound of the 40's, Easy Listening, Jazz, and Foreign to Honky Tonk and Rock and Roll! You can even supply your own music on CD, which would then be returned together with all other original materials upon completion of the job.